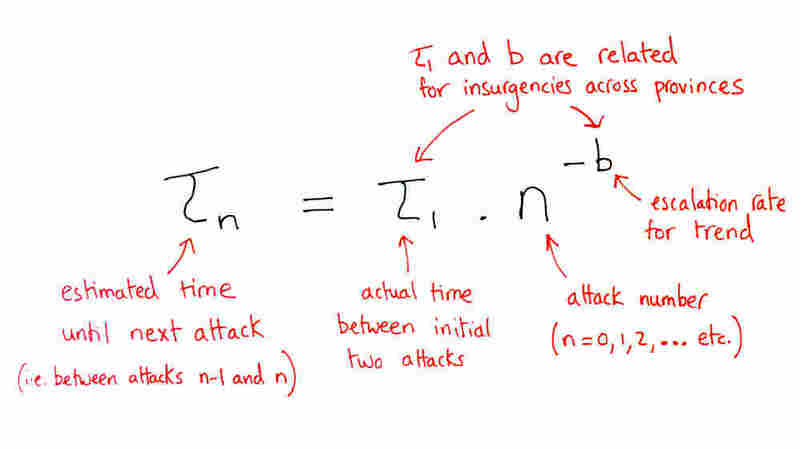 Neil Johnson, a University of Miami physicist, developed this mathematical formula to predict insurgent attacks in war zones. The atrocities of war often seem random. But when it comes to insurgent attacks in Afghanistan or Iraq, that's not exactly the case, says Neil Johnson, a physicist at the University of Miami. Johnson tells Guy Raz, host of weekends on All Things Considered, about the equation his team has developed that predicts when such attacks will happen. "We found ... that there was a kind of rhyme and reason behind the numbers," he says. "They weren't just accelerating, they were accelerating in a particular way." Johnson and his research team gathered publicly available data on military fatalities in Afghanistan and Iraq. On a graph, the numbers created a distinct, upward curve. He says it wasn't just a coincidence; those numbers follow a specific mathematical pattern. In this case, the pattern translates into an equation you can punch into a handheld calculator, says Johnson. It works like this: Say two attacks happen in the same general area. Take the time interval between those two incidents, plug it into the equation and it gives an estimate of how many days until the next attack. "That immediately gives you a time interval between the first two attacks," explain Johnson, "You take that, put it into the equation and it gives you an estimate." It's only an estimate, Johnson admits, but it's better than not knowing anything at all. The equation is based on the learning curve of an insurgent group when it comes to executing attacks. Think of it this way: A group of people, for example, medical students, are trying to complete a task, like surgery. The medical students keep practicing doing surgery, and over a period of time, they become better at completing an operation successfully. Only in this case, it's insurgent groups practicing bombings. "They got some kind of task, which is to carry out among other things, fatal attacks on coalition military," he says. "And as they do it, they're getting better but they're getting better in a specific type of mathematical way." The Department of Defense is "actively interested" in the equation, which has just been published in the journal Science, Johnson says. He's also working on an even bigger study, funded by the U.S. Office of Naval Research, to estimate military and civilian causalities more accurately.